Four-part third series of the spin-off of ITV's long-running crime drama 'Inspector Morse'. 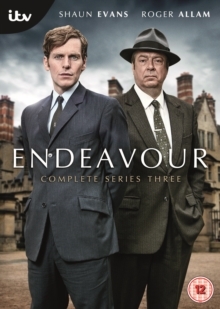 Set in the mid-1960s, the show follows Endeavour Morse (Shaun Evans) in his younger years as a police constable. Working alongside his senior partner Detective Inspector Fred Thursday (Roger Allam) and Sergeant James Strange (Sean Rigby), Morse engages in a number of investigations around Oxford, England. The episodes are: 'Ride', 'Arcadia', 'Prey' and 'Coda'.